The Crock Pot SCV400KB-IUK Slow Cooker in black has a 3.5 litre capacity and a removable stoneware pot, the large 3.5 litre capacity allows you to make delicious stews, curries and slow cooked meals to feed the family and the removable pot allows you to put the pot on the table for everyone to dive in. 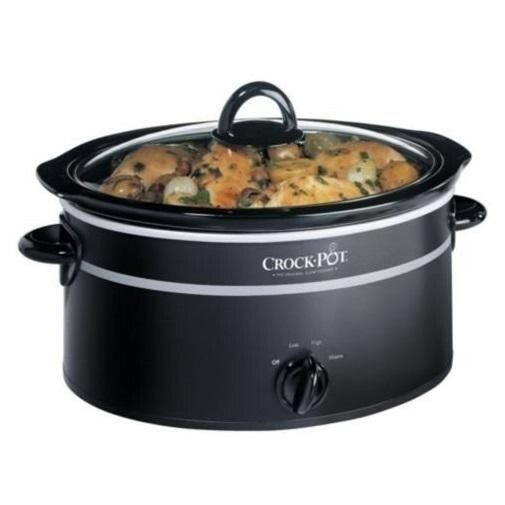 The slow cooker is easy to use with just a simple dial on the front, choose between low or high heat and then once your food has cooked select warm to keep your food nice and warm. The stoneware pot can be used in the oven to give your food a melted cheese topping and the pot is also dishwasher safe ensuring you can easily clean up once you've finished.